Security Printing & Minting Corporation of India Ltd (SPMCIL) has released the SPMCIL Officer Admit Card 2019 on 30th January 2019. The applicants can download their SPMCIL Officer Hall Ticket through the link given at the bottom of the page. SPMCIL is planning to conduct the exam on 23rd February 2019. The candidates who had applied for the Officer Written Test can get their SPMCIL Officer Admit Card. As you all know, how important to carry the hall ticket to the examination hall. Moreover, hopefuls can refer spmcil.com Officer Selection Process given below. As you all know that SPMCIL Exam Date is released to fill 28 Officer vacancies by the officials of Security Printing & Minting Corporation of India Ltd. With this in Mind, we suggest all the applicants prepare well for the Exam. For the sake of the applicants, we had provided all the details of the SPMCIL Officer Exam such as spmcil.com Officer Selection Process, SPMCIL Exam Date, Link To Download etc. The below given table gives you the details of SPMCIL Officer Hall Ticket in brief. By referring to this post, you will get a clear idea. Moreover, after the selection process, the candidates will be placed Across India in the Officer role. Accordingly, the applied candidates can check each and every information form this article which is gathered from the official site. The Most Important thing you need to keep in mind while taking an exam is to take Hall Ticket along with you. Not only Hall Ticket, but also an Identity proof is much more important for the verification purpose. Hall Ticket must be downloaded 10days before the scheduled SPMCIL Exam Date. Also, you need to save a copy of it for safe purpose. The candidate should be aware of the spmcil.com Officer Selection Process before attempting the SPMCIL Exam. Also, you need to get a good score in the various rounds during the Selection Process. Please, Make sure that you carry all the specified testaments along with the SPMCIL Hall Ticket. As you all know that Identity proofs are very important for verification purpose. As per the guidelines of SPMCIL, need to take any one of the files given below. Next, go to the Official site of SPMCIL i.e., spmcil.com. Then, you will see a home page on the screen. Check for the flashing link that refers to the SPMCIL Officer Admit Card 2019. Date Of Birth to access the login. 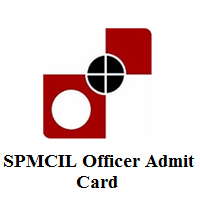 Download the appeared SPMCIL Officer Admit Card to your PC. Keep a copy for safe purpose with you until the recruitment process ends. Finally, hope we brought up more information about the SPMCIL Officer Hall Ticket. Likewise, you can search for such similar details follow our website Freshers Now. Drop a comment if any doubts. Soon we will respond with suitable answers.